Whether you’re on a first date, meeting new people at a dinner party, or making it rain on Twitter, it’s just not a good idea to go on and on about yourself. It’s just awkward. Conventional social media marketing wisdom suggests that brands should avoid being overly self-promotional. Thus, brands seek to “be a part of the conversation” by sharing links that are relevant to their followers but often not specifically about their products and services. This act of finding good content and sharing it is known as content curation. Contrast this with another nugget of conventional social media marketing wisdom: that “content is king” – that the best thing that a social media marketer can do is create content that people find valuable enough to share with the world. But…isn’t promoting your own content akin to talking about yourself? And isn’t that rude, and thus ineffective? This creation-vs-curation paradox inspired me to look for some answers in the data. The selected sample included more than 150,000 tweets and status updates from more than 1,000 Twitter, Facebook, and LinkedIn accounts between November 2010 and July 2011. Our customers are typically professional marketers representing a range of company sizes across most major industries. The graph below shows the sharing mix across all companies in our sample. In short, 30% of the companies in our sample are curation-focused: 75% or more of their posts link to third-party websites. 13% of companies are creation-focused: most of their posts link to their own websites. There are clearly a broad range of strategies employed, although companies tend towards strategies dominated by content curation, with 2/3 of companies linking to others more frequently than they link to themselves. Which Works Best, Curation or Creation? The real question, though, is what should companies be doing? What is the optimal content strategy, creating or curating? To measure that, let’s look at the impact of content strategy on click rates and conversion rates. When looking at clicks, curation clearly dominates. 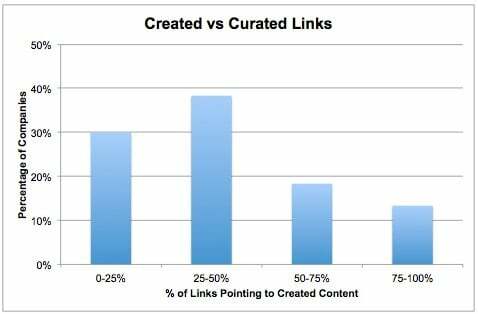 Posts linking to third-party sites generate 33% more clicks than posts linking to owned sites. This makes sense — the very best content on the Internet is typically not going to live at yourcompany.com. However, if you’re looking to drive conversions, content creation is the optimal strategy. Posts that link to your website have a 54% higher click-to-conversion rate than posts that link to third-party websites. This makes implicit sense, since conversions happen on your website. If you’re not driving people to your website and giving them good content to read when they get there, they’re not going to convert. But the choice isn’t really between creation and curation — you should be doing both. The question is really what mix of those two strategies you should employ for maximum clicks and conversions? To dig deeper into what mix of creation and curation works best, I’m going to revisit the behavior segments that I outlined above. What kind of results are companies in each of these segments seeing? Curators = Companies that link to third-party sites 75% or more of the time. Companies in this group focus very heavily on curation and rarely, if ever, link to their own content. Their results bear this out: they generate a lot of clicks, but very few conversions. Balanced = Companies that link to third-party sites 50-75% of the time. Companies in this group employ a balanced strategy of content creation and content curation. Their clicks per post are lower than Curators, but they generate significantly more conversions. Self-Promoters = Companies that link to their own content 50% or more of the time. Companies in this group link to their own content a majority of the time. This negatively impacts their clicks per post, and this reduction isn’t made up by an increased conversion rate. It’s clear from the data that companies in the Balanced category achieve the best results overall. They generate 20% fewer clicks per post than Curators, but their conversion rate is 10X higher. I’ll take that trade any day. We already determined that linking to your site 25-50% of the time generates the best results. But what if we look at the practices of the top five companies in generating clicks and conversions? What are they doing that has been so effective for them? The top five companies in our sample that generate the most clicks link to their own sites 37.9% of the time. And the top five companies in our sample that generate the most conversions link to their own sites 41.6% of the time. This feels like a pretty solid sweet spot. After digging into the numbers, the optimal balance for most companies is to link to your own content between 25-50% of the time, with 40% being the ideal mark. But beware the law of averages! Just because these numbers are true of overall does not mean that they are the best numbers for you. Outliers exist. My favorite example of an account that breaks the mold is one of our customers, TiqIQ. TiqIQ is in the business of publishing deals on sports tickets via social media. Almost every one of their posts links to a site where visitors can purchase tickets from them, so they almost never curate. However, their click and conversion rates are off the charts, because their audience is specifically following them to receive these deals. If you’re new to social media marketing, a 40% content creation rate is a good place to start. But make sure you measure your own efforts and find out what works for your company. Tristan Handy is the Director of Operations for Argyle Social, a social media marketing dashboard that helps businesses create real returns from the social channel. Follow him on Twitter @jthandy.